GBPUSD is in consolidation for the downtrend from 1.3298, the bounce from 1.2475 is likely consolidation for the downtrend. Range treading between 1.2475 and 1.2850 would likely be seen in a couple of weeks. 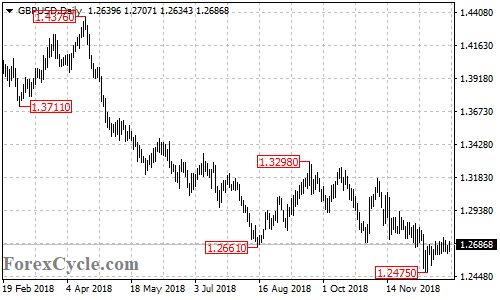 As long as 1.2850 resistance holds, the downtrend could be expected to resume and another fall towards 1.2300 is possible. On the upside, a breakout of 1.2850 resistance would indicate that the downside move had completed at 1.2475 already, then next target would be at 1.3050 area.